Okay, okay, I'm playing with you. 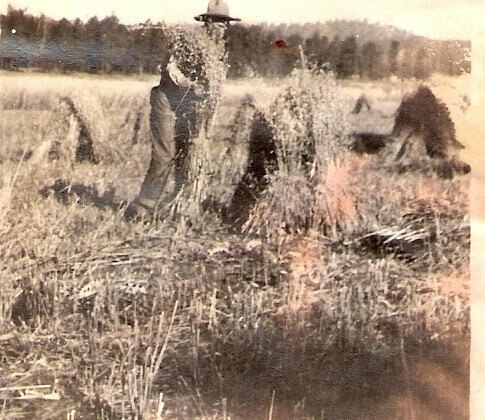 Lennie indeed had a "shocking" week but the word refers to working in the oat fields. The first photo is in an oat field. The second is in wheat, but I'm thinking both oats and wheat were harvested in similar manner. Lennie was undoubtedly working for a nearby farmer. While the men worked in the field the farmer's wife would be cooking up a storm, making sure each man had a good portion of vittles including pie for dessert. A farmer always fed his hired crew. Tried to fix Guy's wheel. Took possession of Santiago yesterday. Came out Peterson's last night. Shocked oats in the afternoon. IOGT had picknick in Dixon's Grove. Came in town to IOGT. Band in town at night. Next week Lennie's friend, Joe Peterson, will have been impressed by Lennie's new watch and will be ordering one for himself. I'm guessing that "shocking" is cutting/harvesting? I know hay has to be baled or bound, but I don't know anything about oats. Obviously moisture on the fields didn't interfere with shocking.